A false start is defined as “an unsuccessful attempt to begin something.” They can occur in a number of sports. A runner or swimmer starts too soon. 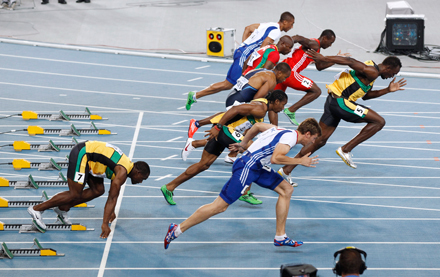 False starts, however, are most commonly recognized from the game of football. When someone makes an illegal action (like this guy running full speed while the rest of team is standing still—epic fail), the entire team suffers and has to move backwards, increasing the distance they had from accomplishing their goal. False starts not only occur in the NFL, but also in the real world. If the events of this year have taught us anything, it is that our country, and the church, have had a number of false starts when it comes to racial reconciliation. For the few places that are striving toward racial reconciliation—whether ministries, politicians, or businesses—events like in Charleston, McKinney, Ferguson, and Baltimore don’t simply reveal how much more work to do. They are litmus tests for how much true progress has been made, and if we are not careful, how much the little progress that has been made can be lost. The truth is we are one people. The entire human race. We are one, with all of our differences, perspectives, hopes, fears, and dreams. Collectively, we are incredibly strong. Separated, we are frighteningly destructive. What happens to one—directly and indirectly—affects us all. I was confused why stock analysts were panicking about dollars in Greece at certain points during the last few years. Their economy has implications for our economy. If this is true from a material standpoint, how much more true is it from a spiritual one? We are one body, “made up of many parts” (1 Corinthians 12:12). Any injustice committed to any South Asian person directly and/or indirectly affects the Black community. When our Latino brothers and sisters suffer from systemic injustice, it affects Native American communities, the broad diaspora of White communities, and so on. Multiple Definitions. Many people use the words but very few have an agreed upon definition on what they legitimately mean. For the dominate culture—I would suggest any context where any group is in the dominate category (economically, politically, ethnically, etc. )—racial reconciliation means “open doors.” Those who were once excluded are now brought in. They have a “seat” at the table and their “voice” is allowed to be heard. For people in the sub-dominate group, it isn’t that simple. There is tremendous pain, wounds, and mistrust that has occurred for weeks, months, years, decades, even centuries. That will not go away overnight. Forgiveness must be requested and given, and trust has to be build. Additionally, many—not all—sub-dominate groups don’t simply want a seat at the table, they are looking for recovery of what was lost or taken away. (That’s not a call for reparations, as much as repairing the damage to communities that suffered systemic long-term damage from legal injustice.) In short, voice is given but without power to affect change. Any and all repairs needed to a community—whether economic, emotional, educational, etc.—lies primarily with the formerly oppressed or marginalized. In our country, generational burdens from segregation aren’t redistributed, just partially acknowledged. Starting with the present while never addressing the past—how this present was made possible—will cripple the conversation before it begins. I remarked to friend the other day who was commenting about the progress of the last 150 years since the Civil War ended. I responded, “If I walk a mile in 45 minutes, some would call that progress; but if I walk a mile in 45 years, I would have difficulty calling that progress.” If racial reconciliation means to some “I hear you,” and to someone else “Repent” or “Change,” we will have a lot of false starts. Multiple Voices. Eugene Robinson, in Disintegration, states 50 years ago “Black” in the U.S. meant the descendant of slaves. Today, “Black” has splintered into multiple groups: descendants of slaves (ranging in economic power from middle class to abject poverty), bi-racial people who have one Black parent in their DNA with another person of any other ethnic descent, 1st & 2nd generation African immigrants/families, and affluent Blacks that have enough money race isn’t a limitation (Oprah, Jay Z, Magic Johnson, etc.) Whose voice are we listening to when we engage dialogue about racial reconciliation? Depending on who you ask, you could get several different answers. If we are only listening to and looking to one group to speak for the broad diaspora of “Black,” there will be gaps. This is why Ferguson and Baltimore had peaceful and violent protests, CNN’s Don Lemon asked questions that infuriates many in the Black community, Fox News has Black commentators that support all of their views, and the list goes on. The community is splintered and if we have selective hearing, we can assume progress when there has been little made for if true progress had been made, our responses to national racial tragedies would not be as wide and varied. The same is true of the Asian Community. “Asian” in America means Chinese (Cantonese and Mandarin speaking), Korean, Japanese, Filipino, Taiwanese, Indian (South Asian), etc. When it is said, “We are reaching/want to reach the Asian community,” to whom are we referring? We can easily assume progress, when in reality, it could be a false start. The Silence of Adam. Genesis gives the Creation Account for humanity. In Chapter 3, Adam and Eve eat a piece of fruit they aren’t supposed to and ruins the rest of the book! Historically, Eve gets all the blame, but the Bible does say, “She gave some to her husband, who was with her, and he ate it” (Gen. 3:6). Scripture records Eve’s conversation with the Serpent, but Adam who is present, is silent. It is chilling to consider he was present at one the most pivotal moments in human history, and he settled for being an eyewitness over engaging. Whatever hopes, aspirations, visions, sermons, tweets, Facebook posts, friends of any color we have, when silence is the only thing heard during times of racial tension, it dissolves any progress that may have been made. If people have limited cross-cultural experience, then much of what they receive about other people is from the news and media. If there is a continuous loop of white police shooting unarmed Black people, angry Black protesters screaming for justice, a 15 second loop of Mexicans crossing the border illegally into the United States, it will influence us—whether we believe it or not. When there are no positive examples to contribute to one-sided news reports (i.e. white pastors calling for justice, Black pastors calling for peaceful protests, Mexican families interpreting the hopes for those families, etc. ), the narrative in most our minds is filled with what was said in the past…and the past has far more negative comments than good ones. (A catalyst for advocating for racial-reconciliation in my life occurred when many white leaders reached out to me and my friends to grieve terrible racially charged events on campus. It gave me a picture of what health can look like. I have been chasing it ever since.) It is saddening to watch friends have an endless sea of comments on LeBron James’ return to Cleveland, Tom Brady’s Deflategate, Avengers: Age of Ultron, favorite restaurants, and everything else we post but to hear or see nothing when it comes to issues of race and ethnicity. Silence is violence, not reconciliation, and it will always produce a false start. The Absence of Adam. In Genesis 4, when Cain kills Abel, Adam’s name is nowhere in the account. Only the two brothers and the mom are mentioned. The only other man on the planet is absent when his two sons fight to the death. Absence is similar to silence, but slightly different. Silence breaks cross-cultural trust, but absence means being not caring to the point of being oblivious. Granted, we don’t know what we don’t know. However, if we want to be committed to racial reconciliation, we cannot afford to be oblivious. I can never be oblivious. A non-Black person can get a Bachelors, a Masters, and PhD without ever having to encounter a Black person or their culture. The reverse, however, is that I as a Black man cannot get a GED without being exposed to white culture. I am never oblivious. If I can return to my comfort zone and reduce my awareness of events, true racial reconciliation will not occur, but a false start. Let me give 4 practical steps to embracing true racial reconciliation. These will not solve all our problems, but they are steps in the right direction and ensure false starts will stop occurring. If I may suggest, if we are serious, whoever is “the least of these” should have the dominate voice in deciding on the definition. If a group has been historically unheard and doesn’t have power in conversations like this one, it is a guarantee that won’t feel heard or valued when that vision or definition is defined. We must also give each other time to discern what racial reconciliation means and what we are willing to commit to. At best, we will be in one accord. At worst, we may lose some people because they are looking for something more or different, but at least we will know. Become “Not Racist” but “Antiracist.” It is not enough when someone says, “I am not racist.” We must become “antiracist.” We must become allergic to injustice and racism wherever it exists—in our hearts, our homes, our churches, our communities. Absence and silence end when we become advocates for those who have been long overlooked and dismissed. When the unheard see people who don’t look like them advocating for them—without having to ask for that advocacy—trust will be built in biblical proportions. Challenge “those” conversations, actions, and attitudes. Ask questions. Seek to understand if injustice has occurred. Defend the cause of the overlooked and unheard. Don’t just cast it out of your heart, but your house and your neighborhood, too. Develop a Ministry of Presence. Henri Nouwen said, “It is not always about saying the right thing or doing the right thing, but simply being present can mean the world to someone.” Being present means listening to the hurting without correcting, presenting data to give hope, or any other means to recolonize someone’s thinking in the midst of grief. Sometimes people need space to grieve. 24 hours after the Charleston Shooting, news reports and leaders were calling for healing, progress, and gun control. The Black community needed—and still needs—space to mourn the continued history of racist attacks because of the color of our skin. Our community, especially the church, is high off of hope—not biblical hope. True hope comes from balancing lament and praise. Without proper space to process and mourn, true progress cannot be made. So sit with us and listen. Love. Learn. Lament. With us. These are not answers, but hopefully hopefully steps in the right direction. There are no easy answers in the midst of difficult situations, but we must speak into them and walk through whatever valleys life throws our way. We will either move forward together or pass our lack of progress on to the next generation. Let’s break the cycle and move forward. So much here to learn. Thank you for continuing to speak while grief is so raw. I will be back to read this again. Hi Sean. I’m wondering if you’d be interested in entering into a dialogue on my blog about what people in the majority can do to come alongside people in the minority? How can we use our privilege to ensure those who are silenced or dismissed are heard and valued? Basically, my white friends are outraged at what’s happening in our country but don’t know what they can actually DO about it. Thoughts? I’d love your feedback! Thx! THAT is true progress. However I can help, count me in.